Clear up a recurring cluster of mushrooms out in the yard with one of these three lawn care strategies. Q: After every rain shower, I find mushrooms popping up all over the lawn. What can I do to get rid of them and keep them from growing back? 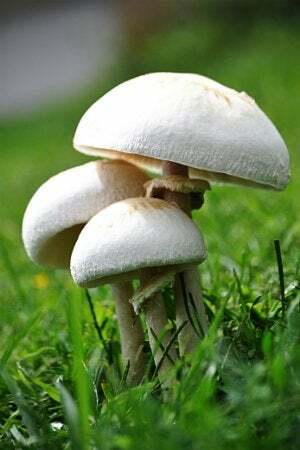 A: You’re not alone in the fight against fungi: Lawn mushrooms are a fairly common landscaping problem, particularly in locations with high moisture and low light. Fortunately, those that pop up in your lawn from time to time tend to be harmless, and sometimes beneficial. They break down organic material in the lawn, deposit nutrients into the soil, and help your soil retain water with their pervasive root systems. But if you don’t like the looks of them—or if you have children or pets who you think may nibble—you can manage them. Most are fairly easy to eradicate; even a persistent recurring cluster can be eliminated, though it may require a more labor-intensive solution. Remove each mushroom at its base. You can pull them individually by hand, cut each with a knife, or simply mow over the whole lot with the lawnmower. Be sure to remove them as soon as you see them sprout, though, otherwise they’ll have just enough time to release spores to plant and grow new mushrooms. For the same reason, you don’t want to dispose of them in your compost. Instead, throw them into a plastic bag and tie it tightly before discarding it in the trash. If you choose to mow mushrooms over, pick the pieces up and discard them into a bag immediately. Reduce excessive moisture and shade in your lawn. 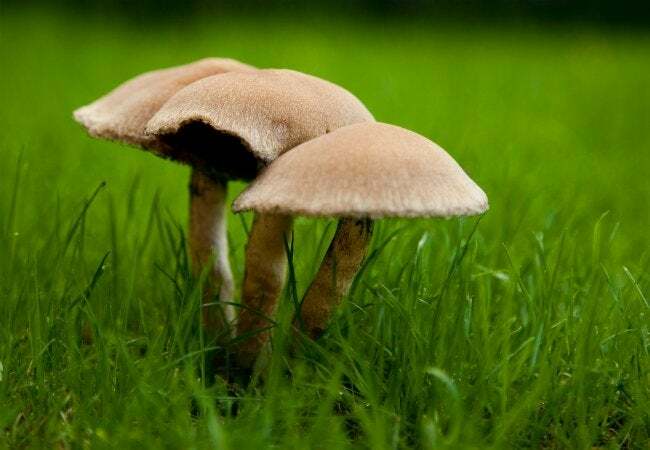 Fungus occurs naturally beneath the grass more often than you see mushrooms; those toadstools don’t become visible among blades of grass until conditions are favorable—that is, damp and dark. To make your yard less attractive to these eyesores, first improve its drainage with the help of a lawn aerator. Available to buy or rent, this lawn and garden tool pulls narrow, cylindrical plugs of soil out of the grass every couple inches, allowing better air circulation and drainage. Adjusting your usual lawn care routine can also keep your grass drier; water less frequently (only 1 inch of water per week) and mow more regularly, as short grass dries out more quickly than long grass. Still see mushrooms cropping up in a shady corner of your property? Trim and/or thin nearby tree branches so that more light can reach the lawn, thus making the environment less agreeable for mushroom growth. Clear out any organic material. Fungi feed on decomposing organic matter, from dead tree roots to grass clippings. Discourage it from sticking around after you’ve removed the spore-bearing mushrooms by reducing its food source. 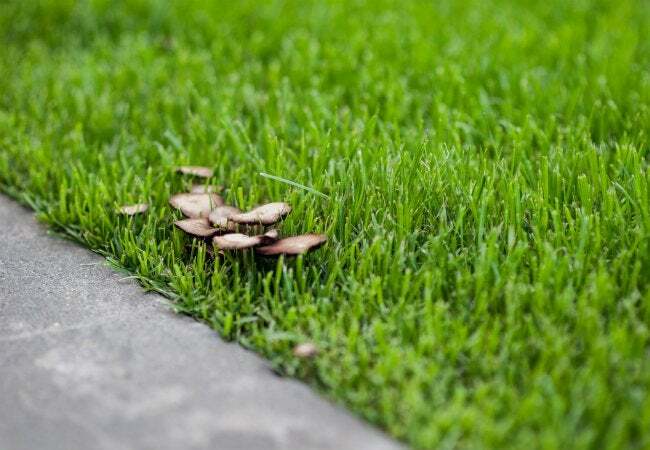 Start by catching grass clippings whenever you mow rather than leaving them on the lawn, and use a rake periodically to dethatch your lawn in the areas where you see mushrooms. If the fungi are feeding on organic material submerged in the soil—like dead tree roots, old mulch, or wood that was discarded during home construction—you’ll need to dig that out as well to stop the constant upcrop of mushrooms. Your best shot at a complete removal is to dig the soil out beyond the affected area, 12 to 18 inches deep and about 2 feet outside of the mushroom cluster. If you think it’s more work than it’s worth, not to worry: Once the fungi have devoured all of that submerged organic material, it—and the mushrooms—will disappear for good.